Situated in the heart of Club Patara, an exclusive four-star development with 24-hour security, hotel, privately owned villas and apartments. From our property you will be able to enjoy every facility expected from such a resort, including private platforms with steps leading down into the Mediterranean, where water sports operate during the summer. There is a choice of three swimming pools available to guests. The 25 metre pool is for the whole family, while the peaceful round pool is for adults only and has a cascading waterfall feature. For young ones there is a children’s pool with slide situated at the top of the Club that enjoys spectacular views of the coast. Tennis courts are also situated here. There is a fitness centre which boasts a Turkish bath (Hammam), mini gym, massage facility and sauna. Water taxis operate a regular service from Club Patara to Kalkan Harbour every day. There are a number of restaurants and bars available to Club guests and a small mini-mart on site. Recently refurbished luxury bathroom (Winter 2010) with shower and hairdryer. Large air-conditioned living/lounge area with TV linked to satellite system and DVD player. MP3 (including iPod) enabled speaker system. Double and triple seated sofas. Fireplace. Fully equipped kitchen with washer/dryer, dishwasher, hob, seperate cooker and grill, toaster, large capacity fridge/freezer, iron/ironing board and water cooler! Notes on accommodation: Fully furnished, luxury, one bedroom apartment, with large lounge/living area sleeping up to four people. The bedroom and lounge are both fitted with air-conditioning units, which can be used for either cooling in the heat of the summer, or heating during the cooler winter months. The apartment comprises fully equipped kitchen with washer/dryer and dishwasher, open plan lounge with fireplace, satellite TV and DVD player leading out on to a magnificent terrace, which can also be accessed through French doors in the bedroom. The terrace itself offers stunning views over the bay, including Kalkan harbour. Outside: One of the main attractions of the Club Patara Resort are the established, lush, tropical and well maintained gardens. Our property has access to one of the largest terraces in the whole resort, with stunning views across Kalkan Bay to the harbour from which to enjoy an evening cocktail, whilst watching the sun go down on the opposite side of the bay... Guests are able to use the tennis courts or health club, as well as any of the three outside swimming pools. Although the 'adults pool' is strictly for the over 16's only. There is also direct access to the platforms and sea from the resort, where there are also water sports available. It should however be noted that from November to April, the pools may be drained for maintenance, although the pool within the health club will be available. Cleaning / Towels / Linen / Maid service: Linen and towels are included, although you will need to bring your own beach towels. Daily or weekly cleaning can be arranged locally. As previously stated, the Club Patara Resort has direct access to the sea. However, there are many fantastic beaches and beach clubs in the area. Patara Beach – around 15 minutes away by car is 19kms in length and is reputed to be one of the top ten beaches in the World! The nearest airport is Dalaman, around 145kms or around 1.5 hours drive away. Antalya Airport is around 250kms and around 3 hours drive. Most major car hire firms have offices at both airports and transfers by taxi can be arranged. The Club Patara Resort is on the other side of the bay from the centre of Kalkan and can be reached by car/taxi in around 2 minutes, by water taxi directly from the resort in about 10 minutes, or it will take around half an hour to walk to town. Other local towns and attractions include the ancient sites along the Lycian Way (such as Patara, Demre, Myra & Xanthos), trout farms in the hills, Saklikent Gorge, local markets and shops in Kalkan, Kas and Fethiye. 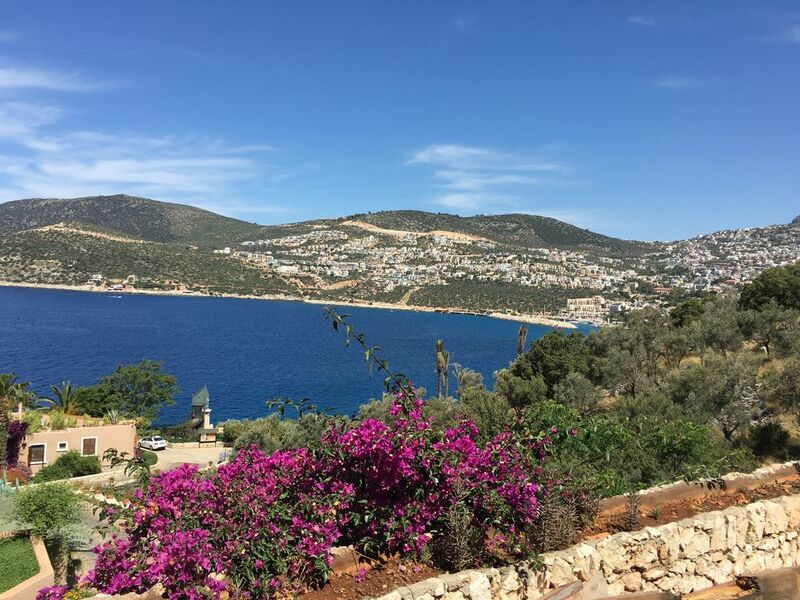 Kalkan was once a simple fishing village, but today is a small, sophisticated and charming market town. Kalkan possesses a multitude of excellent rooftop restaurants offering all manner of culinary delights. The narrow streets twist down to the harbour which is the focus of the town and here you can enjoy a meal whilst watching the world go by.